Where is Briar Creek Located? 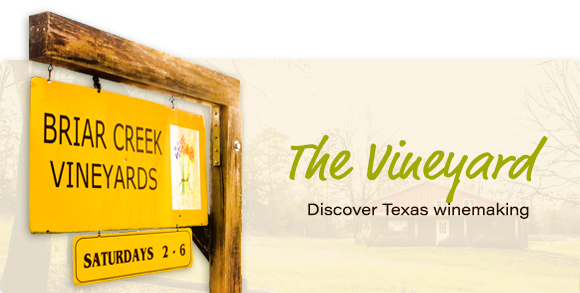 Briar Creek Vineyards is a working winery and vineyard. Our tasting room is open on Saturdays from 2-6p.m. or by special appointment. Small groups have gathered for meetings and programs by appointment. Where can the wines be purchased? They can be purchased locally at some stores and, of course, here at the winery. A few of the local restaurants also carry our wines. Learn about our Wine Club below to enjoy our wines regularly. Can I schedule a tasting or tour? Tasting and tours are part of the experience on Saturday afternoons. Come for a glass or sample all 7 of our wines. How many wines does Briar Creek produce? We currently have 7 labels: 3 dry reds, a Chardonnay, 3 slightly sweet (Rose, Red, and Blanc) wines. Except for chardonnay, our grapes are grown and wine is produced and bottled entirely at our vineyard. 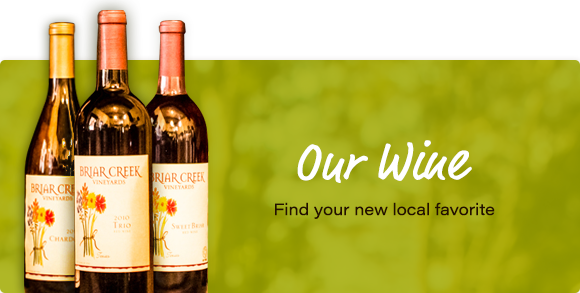 To ensure a regular enjoyment of Briar Creek wines, please join our wine club! You choose or we choose! Contact will be made for credit card information.